Whether the issue is dispensing glaze, polymers, air, or blood by-products, Accudyne Systems, Inc. has the proven expertise to precisely control fluid motion. Our engineers have demonstrated this in a variety of fields. By mating high volume, low-pressure (HVLP) commercial spray heads to electro-pneumatic regulators under proprietary control algorithms, we have achieved glaze-application control that sets the industry standard. 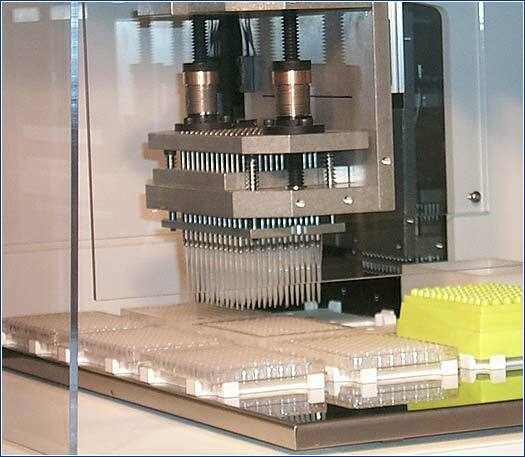 In the area of biological testing, our engineers have developed both 96- and 384-pipette heads capable of simultaneously acquiring or dispensing highly accurate, micro-liter volumes. This expertise, when combined with our other base technologies, gives us a large and diverse skill set to successfully satisfy the unique demands of our sophisticated customers.